– Gingivoplasty is also recommended when we have gingiva pockets, spaces between tooth and periodontium, ideal places for microbe traps. – Finally, Gingivoplasty is an optional treatment when we have elongation of the crown and a part of the root of the tooth, in which case the periodontologist takes a graft from the patient’s mouth and covers the tooth elongation. 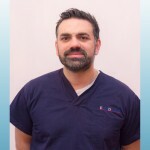 – Gingivoplasties are routine therapies and in EURODENTICA they are done by speciacized Periodontologist Dr. Christos Kritikos.